Couscous is a staple food throughout the North African cuisines of Algeria, Morocco, Tunisia, Mauritania, Libya, and Egypt. Place the couscous in a medium bowl and add ½ cup boiling water. Cover and stand for 5 minutes. Heat half the oil in your Pineware electric frying pan and cook the mushrooms, stirring for 4-5 minutes. Set aside to cool. Add mushrooms, cheese and parsley to the couscous and season with pepper. Split each chicken fillet length ways without cutting all the way through. Working with 1 fillet at a time, place between 2 sheets of baking paper and pound with a rolling pin to flatten. Place ¼ of the couscous mixture on half of the chicken, leaving a 1 cm edge. Fold over chicken to enclose the filling, pressing edges together. Wrap with a rasher of bacon. Repeat with remaining chicken, couscous mixture and bacon. Heat the remaining oil in the electric frying pan over medium heat. Cook the chicken parcels for 5-6 minutes each side or until golden and cooked through. 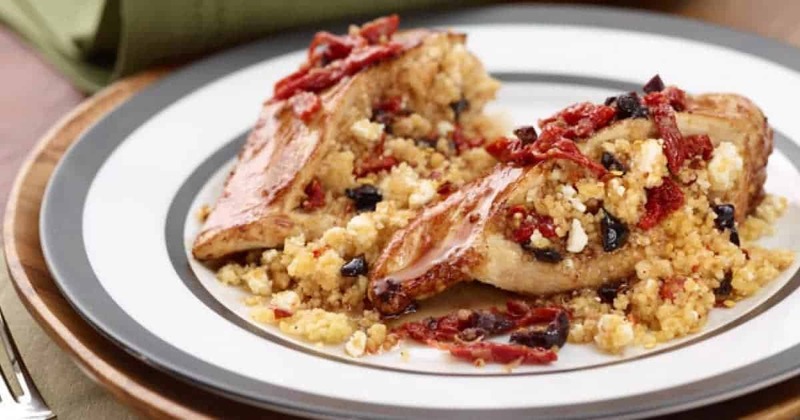 Hey Buddy!, I found this information for you: "Couscous Stuffed Chicken". Here is the website link: https://www.pineware.co.za/recipe/couscous-stuffed-chicken/. Thank you.